Nazi survival stories are a common item on this blog. It's a somewhat macabre thing to be fascinated with, and I'm quick to distance myself from any "longing" for a scenario where the Nazi empire continued to survive past the battles of Berlin and Prague. But... it is something that presents a rather interesting thought experiment; how would the world react to the re-emergence of a Nazi regime? Just think about that for a moment!! Whilst aliens are usually the favourite explanation for UFOs, the Nazi's appear to run a close second. We've covered this before, but it goes much deeper than I thought. 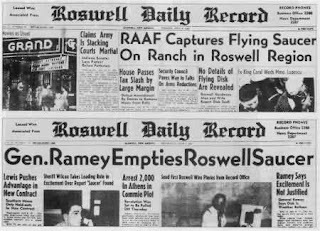 Even Roswell, sacred to ufologists everywhere, comes under scrutiny as possible evidence for Nazi survival. There's two favourite Nazi explanations: 1) as part of Operation Paperclip the US Government was part of the experiments which led up to the crash at Roswell or 2) the Nazi's set up a still undiscovered (or at least unannounced) redoubt somewhere and were kept an eye on their old foes with UFOs when the crash happened. Personally I think the whole Nazi survival/UFO thing is a lot more believable than the possibility that aliens are observing us (I believe in aliens existing as a general principle but I find it highly likely they would use the sort of technology it'd take to travel the distances required just to "observe" us, after all that travelling you'd think they would be a bit more chatty) . But that's not saying much.